Setting up a new business can be both exciting as well as nerve-racking; Exciting because you finally get to be independent and nerve-racking because you get to do things all by yourself that too within a budget, which is usually skewed. Few things that can push you further in your plan of becoming a successful entrepreneur are keeping constant focus on the vision and by staying flexible to market dynamics. Any business you set up should have an idea behind. An idea of where you want to be, how you want to be in time in the future. An idea is nothing but a plan that you need to execute. No matter how much you think you know, you are bound to know less than you realize. So, surround yourself with people who can give you necessary suggestions time and again. Interact with people who challenge your way of thinking about things you do know. You can also continuously research your market and be open to new opportunities. Few years back I started on my own and I know the drill. So, through this post I am going to share with you few business tips that I learnt during my entrepreneurship tenure. Here are the Branding Tips with 30TH FEB.
Don’t just aim to run a business, make an identity and create a brand on the foundation of trust. Branding is all about creating unique value for your customers. Be clear and consistent in your branding communication that will help you build your business values, help you achieve goals easily and help to create a brand personality. And over the time, you will build a stronger business identity. A strong brand prompts strong emotions, opinions and responses from target markets that contribute to the growth of its business. 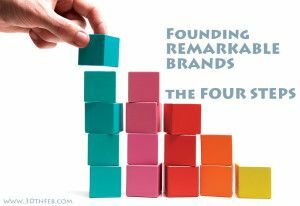 So, remember your brand determines the position and strength of your entire marketing framework, and serves as a constant internal point of focus. 30TH FEB’s Tips: A company profile through a brochure helps in the introduction of the brand, what it is all about, what are its values directly to the client. It’s the prior thing to give importance to when creating an identity. And since it’s an identity, it has to be appealing look wise and interesting content wise. As a premium Brand Design Agency, we can create one for you – online or offline. Be it the hardship of quitting a smooth career or deciding to start your own, no one becomes a successful entrepreneur without making few wrongs. Those become the stepping stone of success. Entrepreneurship requires trial and error to find the best way for you to execute it. In the beginning you may make bad investments, you may partner with a wrong person or end up hiring a good for nothing. But it will only push you in the right direction. The only thing you need to keep in mind is not to make the same mistake twice; that may cost you much. Carefully review the path you took, make changes where you think you can be better and move ahead. 30TH FEB’s Tips: Owning a business is not only about focusing how to run it, in order to run it successfully, you need to focus on the brand building. Which platforms to promote your brand, where to find customers, how to engage them, what’s the branding strategy for the next quarter, all this needs a plan. A brand plan. Been there done that, we now proudly share our knowledge to the new boards. So you can contact us to gain valuable tips on branding strategy over a cup of coffee. Yes it can get that simple! One of the best ways of getting new customers is by getting recommendations from current customers, only if they are happy and satisfied with your services! Make a constant effort of asking your customers to rate your service and recommend you to their friends and family. If possible offer a discount to both those customers who recommend you and those new customers who come to you based on recommendations. Another way of drawing new customer is by giving away free samples of your product or free services. That makes an impression on your potential customer. This is also essential for any branding agency to make themselves approachable and appealing to the client. 30TH FEB’s Tips: Getting recommended, getting hands on feedback etc., come easy with a social profile. They also allow you to reach out and hear out the customer and it is not enough to have a social profile/page but what matters is how intelligently you manage your Brand Socially. How you listen and respond to your customer matters.We can do that for you easily. We can communicate, engage and interact with your customers through design, through digital channels and through your website & blog too. Getting new customers can sometimes be a challenge for small businesses, especially when it’s a start up. You know you need to promote your business but for budget constraints, you end up not being able to spend as much on advertising as you would want. But you can advertise your brand even on a small budget. For that you should foremost figure out where your potential customer can be found. After that you can get in touch with business partners that complement your line of business. For instance, if you are running a gift shop, look for business of cake shops, florists etc. You can contact them and propose them a cross promotion i.e. you inform your customers about their products and services and they do the same for you. You can even exchange business cards or other promotional materials like flyers, brochures, menu for advertising purpose. 30TH FEB’s Tips: Be it creating a brochure or a social profile, a branding strategy or a complete brand profile, get it all at your budget, for your business with our help.